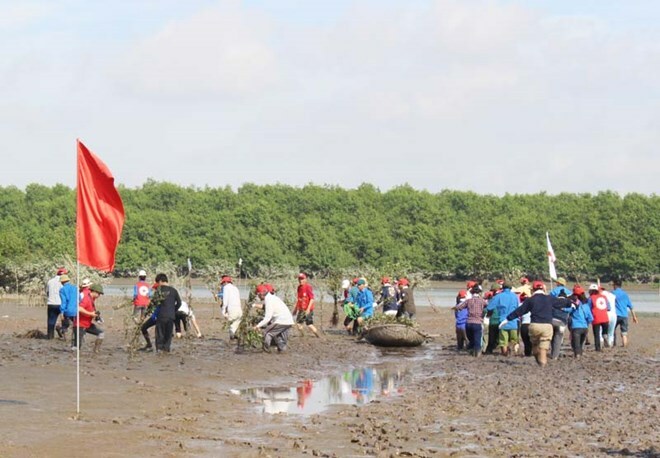 Quang Ninh (VNA) – Red Cross volunteers of the Japanese prefecture of Kyushu and their counterparts from the northern province of Quang Ninh began planting mangrove forest in Song Khoai commune, Quang Yen township, on August 21. They planted 400 mangrove crabapple trees in a mud ground in the commune. The event aimed to raise public awareness of the role of mangrove forest ecological system, thereby urging their efforts in restoring and planting mangrove forests to contribute to mitigating harmful impacts on the environment.